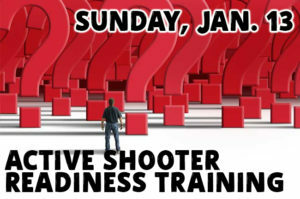 The Linn County Sheriff’s office will provide active shooter readiness training for our congregation on Sunday, Jan 13 from 3-5:30 PM. This training is open to anyone and will involve training to enhance your safety in any situation. The training will also assist us in helping others in our community should we ever face any incidents involving a violent attack. This training is open to others in our community who may benefit—invite them to come with you!